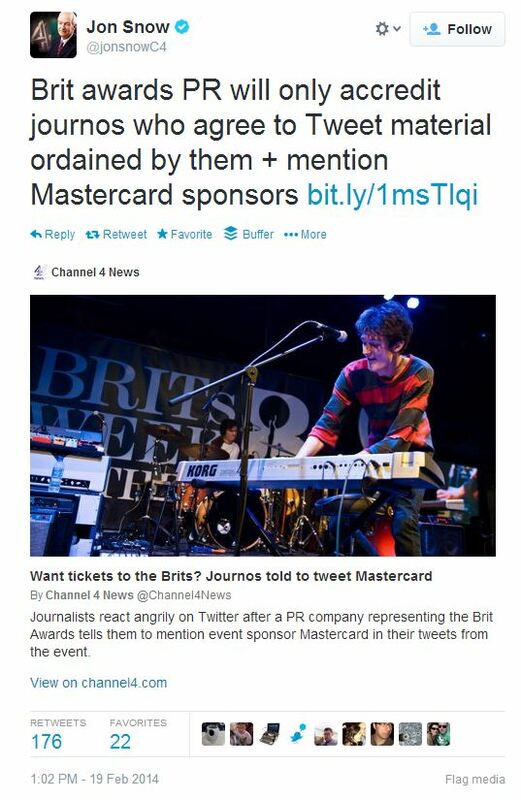 Some journos seem to be a little perturbed at the audacity of MasterCard, sponsors of tonight’s Brit Awards. Apparently they want some mentions of the brand in a tweet or two plus a hashtag and link to a website in return for a limo ride to the event and, no doubt, lashings of booze, food and entertainment from today’s top musical stars (there had to be a drawback). Even Channel 4 News’s Jon Snow has got in on the act. Hmm. I’d say that was a fair trade; wouldn’t you? I mean, the Brits isn’t real news. It’s an industry PR event (the British Phonographic Industry, to be precise), a bit like the UK Nuclear Skills Awards or Pet Industry Awards, that has somehow wheedled its way onto the annual TV schedule. It’s not, and never has been, a national event that’s of the people, by the people, for the people like the FA Cup final and X Factor. There will be no spam fritters. If you want to maintain your journalistic credibility, there’s a thriving folk scene on the Somerset Levels that you might want to cover – and best of all you can even dream up your own hashtags if you like. If you object to mentioning sponsors in tweets, don’t go to the Brits. The sun will still rise tomorrow. Twitter wags are already abusing the hashtag as wags will do whenever they perceive companies trying to clumsily exploit social media to promote themselves. The PR company behind the request to journalists has, not surprisingly, gone into full-on PR mode. And it might be a little bit embarrassing for all the stars who unwittingly associated themselves with the #PricelessSurprises hashtag. In SEO terms, it’s possible that there’s a breach of Google’s quality guidelines, but it’s a one-off thing and is unlikely to have any lasting effect. Not everyone mentioning the event or the website will be on the canapé list. But time will tell. Like all Twitter storms, it’ll probably be forgotten by the morning after. Especially if Jarvis Cocker is sitting near the stage.